After Angela Merkel announced she wouldn't bail out Deutsche Bank, everything tumbled. 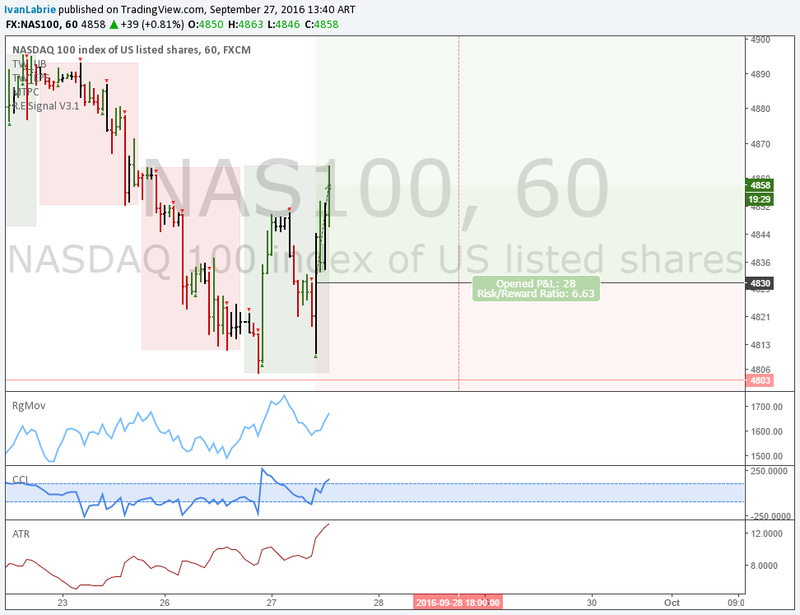 We need to set alerts in NAS100 and SPX500 , at 4803 and 2137.1 respectively. If these prices aren't hit within the next 3 days, it might be a good opportunity to buy 'the dip' once more. After today's close I'll update the chart with more information. Individual stocks longs aren't so affected by this, but if you're in good profit, it's always wise to sell some covered calls at the money when you think a big pullback will occur. Then you can book profits from it (maybe close half the stocks position before shorting calls) and reenter the half stock position lower than your exit. In the next 3 days, the range expansion decline in equities will either confirm the bearish momentum or fail, which coincides with the OPEC news this week, among others. Stay tuned for updates, it's a very critical week for indices. Trade wurde manuell geschlossen: I'm out of longs for now, I'll wait for 2 more days, probably. If we move up from here, we might break above last week's high. If this happens after this week's close, we'll confirm a bearish failure of weekly scale in SPX, which would imply the move down was merely a pullback before the long term uptrend resumes. This week is heavy regarding news and data, so, let's keep our eyes open. Kommentar: Holding NAS100 for a day more, will pay attention to Yellen tomorrow. Trade wurde manuell geschlossen: I'm out for now. I'm waiting to short Dax. Kommentar: Check out August 26th's high...support held there perfectly. Deutsche Bank might be plenty solvent to come out of the slump, against what 99% of people fear.